For the past seven years, Harry Smith has co-hosted CBS's The Early Show, currently the third-place broadcast network morning news program. Smith previously co-hosted CBS's This Morning from 1987 to 1996 while also serving as a contributor to the CBS Evening News, 48 Hours, and various documentaries. In 1996, Smith left CBS to narrate various programs for the History Channel and A&E's Biography. Smith returned to CBS in 2002 to replace Bryant Gumbel as co-host of The Early Show; he also occasionally fills in as host of Face the Nation and anchor of the CBS Evening News. Over his lengthy career at CBS News, Smith has continually shown his detest for conservative figures and causes, while at the same time promoting mainstream liberalism. He has praised liberal figures like Barack Obama and Al Gore in quasi-religious terms, but made little effort to hide his contempt for Presidents Ronald Reagan and George W. Bush. He has championed liberal crusades like global warming, predicting "Manhattan will be underwater by 2050." He condemned the Iraq War, claiming it "didn't make sense," and denounced the Second Amendment as "the right to deliver instruments of certain death." "As the nation prepares for President-elect Barack Obama to move into the White House, many Americans can't help but draw similarities between him and the late President John F. Kennedy....The similarities are striking. JFK was 43 when he was inaugurated. Obama is just three years older, bringing a certain youthful vigor to the White House, including, young children....Kennedy had more than his share of charisma and Obama knows how to light up a room. But it's their wives who might be the real superstars." - Smith on The Early Show, November 7, 2008. "President-elect Barack Obama has been named one of GQ magazine's Men of the Year....Why was he a good choice? ...Can a guy who's cool be President of the United States?" - Smith on The Early Show, November 17, 2008. "I'm just not so sure I've ever witnessed anything like this in all of the politics that I've covered, which goes back quite a few years already. This place rumbled. And there were certain points during the speech when the stadium was just so alive, and the ground was almost quaking." 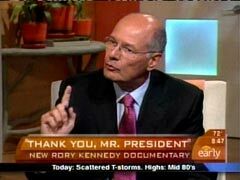 - Smith on The Early Show, August 29, 2008, the morning after Barack Obama's convention address. "Powerful, far-ranging speech this morning that President Obama has delivered in Cairo....He was not only presidential, he was also professorial. He was very much a teacher this morning. He was giving Americans and Muslims a history lesson." - Smith on CBS's The Early Show, June 4, 2009. "It feels like the '60s are back....In the civic religion that is Democratic politics, the most treasured covenant was passed to the young Senator from Illinois." 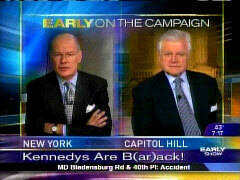 - Smith on The Early Show, January 29, 2008, discussing Senator Ted Kennedy's endorsement of then-candidate Barack Obama. CBS's Harry Smith: "People in the mainstream media have been accused of being afraid to speak truth to power, and I've got - I've got some truth to power for you right now." President Barack Obama: "Okay, go ahead." Smith: "I've been observing, your dog looks like he's out of control." "Many white Americans felt their fears were justified this week when they learned that one in four young black men in this country is a criminal....23 percent of the young black men in America are behind bars, on probation or on parole. As surely as an assembly line, America turns thousands of innocent black children into castoffs....It's one of the accomplishments of America's system of apartheid." - Harry Smith, March 2, 1990 CBS This Morning. "If you are like most Americans, you figured you were lucky that it couldn't happen in your town. Well, you might want to think again. America was shocked and appalled by the violence and riots in Los Angeles last week. But what we saw was not an aberration...Imagine a day when it's true in every American city. Impossible, you say? Wait, and you'll see what happens." - Smith commentary, May 4, 1992 CBS This Morning. "He talked about being proud of what's happened with the economy, about the millions of new jobs that have been created. And as I listened to that, I also thought one out of five babies born in the United States are born into poverty. There are hundreds of thousands of people in this country now that are homeless, have no place to live. I wonder, how does your father reconcile that in his mind? How does he reconcile those two things?" "We would like to believe the State of the Union address is a time when the President tells the American people the way it is. But no one really wants to hear that, so the President keeps reality down to a minimum. The President was remarkably upbeat for a man who runs a country with a monstrous national debt, huge balance of trade problems, a crumbling infrastructure, dirty air, countless homeless people, a coast-to-coast drug epidemic, and a faltering self-image." - Smith, February 2, 1990 CBS This Morning. "Some of the blame for this 'have everything attitude' could easily be placed on the Reagan administration and a compliant Congress. You remember, 'Morning in America. '...Face reality, like Governor Jim Florio has in New Jersey and you've got a revolt on your hands. The recession has cut revenues there, so he's trying to raise taxes in order to still deliver the services the people in New Jersey say they want. That, of course, is political heresy." "We saw the icons of American politics bow down to the almighty dollar [Reagan and O'Neill]. And we threw one last party [Malcolm Forbes] to celebrate the end of the decade of greed. Yet we continued to dirty our planet like there was no tomorrow." - Smith, December 29, 1990 CBS This Morning. "There were 300 of you on the Capitol steps a couple of days ago, got together to sign this pledge which kind of harkened up a lot of memories of Ronald Reagan...Among the things you talk about wanting to do - raise defense spending, cut taxes, balance the budget - but did you all neglect to figure out how to pay for all of that?...But the real deal here if we're talking about Reaganomics, which this seems to be harkening back to, tax cuts for the rich and everything else...You're talking back to the days when budget deficits ran out of control." - Smith to Newt Gingrich, September 30, 1994 CBS This Morning. "It's hard to get the world psyched up for a summit when the stakes keep going down. It used to be the future of all mankind hung in the balance every time the Soviets and Americans talked. That's all changed since our respective leaders finally figured out the expensive and dangerous race to build more and more nuclear weapons was pretty much a waste of everyone's time and resources. There's a limit, after all, to how much of the world you can wreck and still feel good about yourself." - Smith in his weekly "Record of Who We Are" commentary, June 1, 1990 CBS This Morning. "You talk about victims and victimhood in America, which I think is a serious problem. On the other hand, the more I listen to your complaints, the more I kept thinking, well, you're the whiner. You're the one who's claiming victimhood here. That you're the victim of this great left-wing conspiracy....You should - you should have a cross. You should put yourself up on a cross." "In 1980 [actually 1984], Ronald Reagan's optimistic 'Morning in America' appealed to the most basic beliefs about who we are as Americans, and it gave Reagan a big boost. There's a high road and a low road. Remember Willie Horton? The ads played to racial fears and portrayed Massachusetts Governor Michael Dukakis as soft on crime." - Smith reviewing TV commercials from previous campaigns on The Early Show, March 10, 2008. "Empathy has never been one of Rush's strongest suits. Do you detect anything in his broadcast yesterday that would suggest that Rush is now going to become a kinder, gentler Rush Limbaugh?" - Smith to media expert Robert Thompson on The Early Show, November 18, 2003, the day after Rush Limbaugh ended five weeks of treatment for drug addiction. "Do I need to be concerned that I'm going to go live with a church family, are they going to proselytize me, are they going to say, 'You better come to church with me or else, I'm, you know, you're not going to get your breakfast this morning'?" "Even on the radio on the way in this morning, I was listening to a roundtable of older Americans, and they're - it's worse than not thrilled - they're downright afraid of you. Do they have anything to fear from you?" - Smith to Newt Gingrich, April 4, 1995 CBS This Morning. "Many of the attacks that have come from John McCain's campaign have been, quite frankly, condescending. Are you surprised by that? Does it anger you?" "You fought a long battle with the [Bush] White House over this issue [waterboarding terror suspects], said they ought to follow the Army manual, which the White House refused to [do]....Why do you feel so strongly that those who helped create this policy should not face some sort of recrimination?" - Smith to Republican Senator John McCain on CBS's Early Show, April 23, 2009. "Explain the difference between the private man and the public Pope that some Americans are maybe even a little unsure or fearful of." "Fred, you've said time and again that character is an important issue in the campaign. Clearly, that red-baiting junk didn't work for the President last night. What's he going to try next?" - Smith, October 12, 1992 CBS This Morning, to pundit Fred Barnes following the first presidential debate between President George H.W. Bush and Arkansas Governor Bill Clinton. "Brad and Angelina, Charles and Diana, Burton and Taylor, and you can count Bill and Hillary's union as one of the most scrutinized marriages of our time. A simple Google search reveals there are more than 40 books about this still young couple. They met in law school - two bookish, wonkish, idealistic kids who somehow transformed themselves into political rock stars." - Smith introducing an interview with Sally Bedell Smith, author of a new book on the Clintons, on the October 23, 2007 Early Show. "Jimmy Carter the President wasn't particularly well liked. Carter the prophet was right on the money. The gas lines of the Arab oil embargo apparently left little lasting impression, though....Just this week, the Senate killed a bill that would have forced car makers to significantly improve gas mileage. Maybe we just don't care that much." - Smith, September 28, 1990 CBS This Morning. "Helen Thomas has been covering the White House for-ever, almost 50 years now. We're going to talk to Rory Kennedy, director of a new documentary about the legendary journalist....Where she sits and what she does day after day after day, I'm not sure we value enough." - Smith on The Early Show, August 14, 2008. "I've actually admired Dennis Kucinich for a long - since he was Mayor of Cleveland." - Smith on The Early Show, November 2, 2007. "A lot has been written about you in the last couple of weeks. Much of it has a sense that Mario Cuomo is a man full of promise and now that your 12 years in Albany is done, much of that promise is unfulfilled. Do you disagree with that?....The sense of the promise that you may have been able to deliver to people, your eloquence, your intelligence, that did not translate, for lack of a better term, into dynamic governance?....How are you going to use this? Are you, will you continue to use this passion, will you continue to use this eloquence? Some people have suggested you should become a counterbalance to Rush Limbaugh." - Smith's questions to Mario Cuomo, December 30, 1995 CBS This Morning. "You know, I remember being in Iraq...a couple of weeks before the war started and it came - it was really, really clear to me on the ground that this didn't make any sense. And I remember coming back, but there was all this, sort of, preponderance of opinion that this, this thing should go on. And I kept thinking to myself, 'This doesn't - there's - I'm not connecting the dots everybody else is connecting.' And if I have a regret in my reporting life that I didn't stand up then and say, 'This doesn't make any sense.'" - Smith on CBS's Early Show, May 15, 2009. "No weapons of mass destruction have been found in Iraq, this was certainly a cornerstone of the rationale for going to war there last spring. Tony Blair was charged with sexing-up intelligence to justify war. Do you think that charge could be put on President Bush?" - Smith to Senator Ted Kennedy on CBS's Early Show, September 9, 2003. An official investigation had already discredited the BBC story claiming Blair "sexed-up" the British report. "The President said during his remarks to the troops, he said: 'You're defeating terrorists in Iraq so we don't have to face them in our own country.' Now, there's no connection between Iraq and 9/11. Why does the President persist in tying those two together?" - Smith to National Security Advisor Condoleezza Rice on the November 28, 2003, Early Show. "Sock and awe. How the Iraqi shoe-thrower is now being hailed as a hero and drawing thousands of supporters....It's being referred to as the 'toss heard around the world.' In fact, many Iraqis are showering accolades on the journalist who threw his shoes at President Bush." - Smith on The Early Show, December 16, 2008. "A constitutional right which gun lovers have lorded over us for years. But the right to bear arms has blossomed into the right to deliver instruments of certain death into the hands of people who probably aren't sportsmen and probably aren't collectors...While our children are being gunned down by thugs and criminals, we continue to allow ourselves to be bullied by a gun lobby which refuses to budge on issues which make simple common sense....Constitutional rights? Ask the parents of the children who were shot this summer about the right to bear arms. They bear only the pain of their loss." - Smith in his Friday CBS This Morning feature "The Record of Who We Are," August 31, 1990. "Former Vice President Al Gore and Virgin Group Chairman Richard Branson....announced here in London today that they are teaming up to save the planet, offering a $25 million prize to fight global warming....[to Branson] You've only known each other about a year or so as I understand it. Is Al Gore a prophet?" - Smith on The Early Show, February 9, 2007. Co-host Harry Smith: "President Bush getting ready to go to Europe for the G-8. The folks in the European Union want to do emissions reductions. The President said yesterday we're not going to participate....If you were President, you would have probably signed on?" Former Vice President Al Gore: "Yeah, yeah." Smith: "Do you mind if I-? [holds up a 'Gore 2008' pin]...There you go. You can hold it. [laughter]....Here, let's see what it looks like." [holds pin to Gore's lapel]...All right, all right. Save that in a freeze frame." I'm watching you in this film, you look so comfortable in your own skin. You look like Al Gore in full, as it were....The box office receipts would indicate that it's an action movie - you did better per screening then almost anything that's come out this week." Weatherman Dave Price: "I want to show you some video. A lot of people saying global warming, or at least higher temperatures, being blamed for this massive collapse of an ice shelf in Antarctica....In the event that land-based glaciers begin to really melt, you could be talking about a rise in water levels which could be catastrophic, so this is really - look at this video." Co-host Harry Smith: "Right, right. And they also talk about - because as this disappears, this reflects light, alright? That's another huge issue because that ice reflects the light. It turns to water, which absorbs the light. That could be another exacerbating factor in global warming." Price: "Right. And so we continue to watch that situation." Smith, pointing to himself: "Al Gore, Jr."
Co-host Maggie Rodriguez: "Yeah, you are." 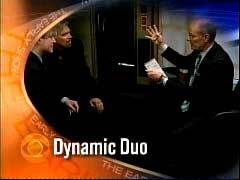 - CBS's Early Show, March 26, 2008. Co-anchor Julie Chen: "You've taken personal action. Tell me what are some of the changes you've made in your day to day life." Actor Leonardo DiCaprio: "I try to live a 'green lifestyle,' quote/unquote. I mean, I've, I've done the things that I can do in my house to make it, my house green, energy efficient appliances. I drive a hybrid car. I have solar panels." Chen: "Where did this passion come from?..." Co-anchor Harry Smith: "He's such a smart guy." Chen: "He is a smart guy and he's such a great spokesperson to have for this very important cause." New York City Mayor Michael Bloomberg: "There's no question that we're damaging our environment. Here in New York City we've got a plan to plant a million trees, to reduce the number of cars on the streets, to make buildings pollute a lot less....Congress talks about goals to reduce carbon in the year 2050. How many people in Congress today are going to be alive in 2050? Just do the math, not very many." Bloomberg: "We need to do something now." Smith: "Manhattan will be underwater by 2050." "When you saw these pictures yesterday from these demonstrations in all these cities across the country, hundreds of thousands of people, American flags unfurled, people draping themselves in the American dream, what did you think?...It's really unprecedented, this groundswell that has come up...People literally all over the country walking away from their jobs to stand in the street and say, 'I count for something.'" - Smith to CNN's Lou Dobbs and Governor Bill Richardson (D-NM) on The Early Show, April 11, 2006. "Let's talk about his words for a second. Because it's not that many months ago that a lot of people were accusing Bibi Netanyahu of fanning the flames of the Israeli right, of setting the rhetorical tone for Rabin's assassination." - Smith to CBS News consultant Fouad Ajami, May 31, 1996 CBS This Morning. Host Harry Smith: "When you see that enthusiasm, though, and when you see this generational change that seems to be taking place before our eyes, does it make you at all fearful?" Senator Edward Kennedy: "Well, not really. I think - what is - I think people are basically saying is that they want a new day and a new generation...."
Smith: "I think what I was trying to say is sometimes agents of change end up being targets, as you well know. And that was why I was asking if you were at all fearful of that." 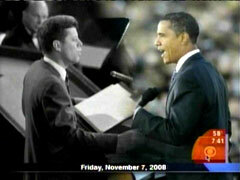 - Exchange on CBS's Early Show, January 29, 2008. "Did you run too close to the middle? There's grousing already in the Democratic Party that Democrats didn't act like Democrats, they acted like watered-down Republicans." - Smith to Democratic National Chairman Terry McAuliffe on The Early Show, November 6, 2002. "The margin of victory is so narrow in so many of these races and it's just a razor thin difference in some cases between the parties. Does that give you a responsibility to govern from the middle or with the majority do you go all the way to the right?" - Smith to incoming Senate Majority Leader Trent Lott on The Early Show, November 6, 2002. "We have seen in the past, during Reagan-Bush administration days, when huge slashes went through, when entire programs were dismantled, and what ends up being left sometimes in its wake is the sort of vacuum and chaos and even more problems than were there to begin with." - Smith responding to Pat Buchanan's criticism of the "Reinventing Government" report, September 8, 1993 CBS This Morning. "How do we do all of this stuff? And we're not making more money, the tax rolls are not growing, the coffers are not full. We're just talking about deficit - if nobody's going to get taxed, isn't this just going to be Deficit City?"